The "Bronze Orange Bug" is a large stink bug which is green when smaller, orange when juvenile, and dark brown when fully mature. At all stages of its development it is pure evil in concentrated form and must die a swift and painful death. The main defense mechanism of these bugs is a thick acrid and very aromatic* liquid secretion, which can be sprayed up to 75 centimetres, with some accuracy. * aromatic in this case is a euphemism for "disgusting smelling". It contains an oily component named "cimicine" on which the internet is strangely quiescent. If it reaches your skin it produces a bright red pigment, which dries the skin, and causes intense stains. The stains darken and become brown over the following days. If you are removing Bronze Orange bugs you must wear more than 1 pair of gloves. Their stain can easily penetrate through a single layer of rubber gloves. Eye protection is also essential. A bee-keepers suit, welders goggles and a nuclear-fallout cover-all might also be advisable. 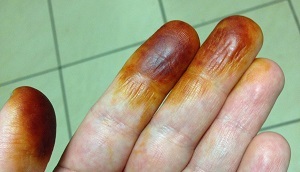 Suggested ways of removing these stains are described below, along with the results of testing each method. This removes the smell, but does not remove the stain. Milk is used as a treatment if this toxin gets in the eyes. As a stain remover it achieves nothing. Extra Soap and water. Lots and lots of extra soap and water. Keep doing this long enough and you'll aggravate the skin, but you won't remove any cimicine at all. This is a much-loved stain remover. I tried scrubbing with it, and then soaking in it. Neither of which did anything. This is useful in removing henna-dye. Against cimicine it does nothing! A weak acid. Too weak for cimicine! This does nothing! A tattoo removal laser gun does not remove cimicine stains. At the time of writing, this is my recommended approach to cimicine stains.